I’ve been thinking about the long WI Northwoods winter ahead, and what weaving I would like to do during the coming months. This is a preview, I hope, of what will be appearing on this blog. 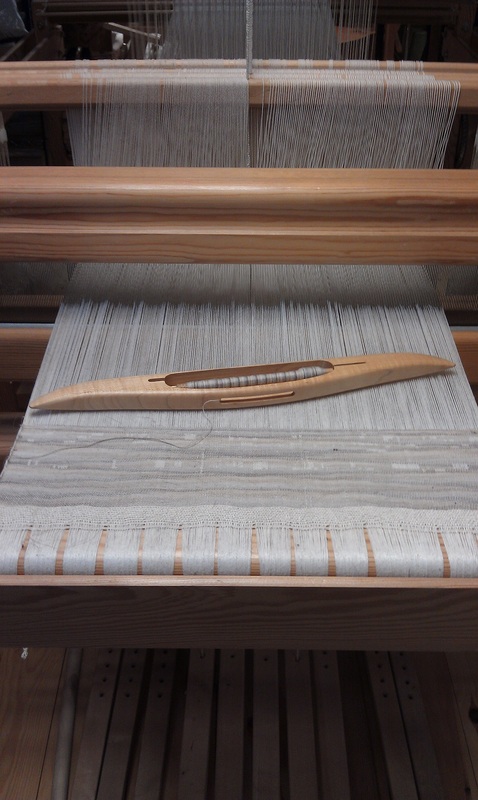 Warp and weft for the Glimakra Regina. 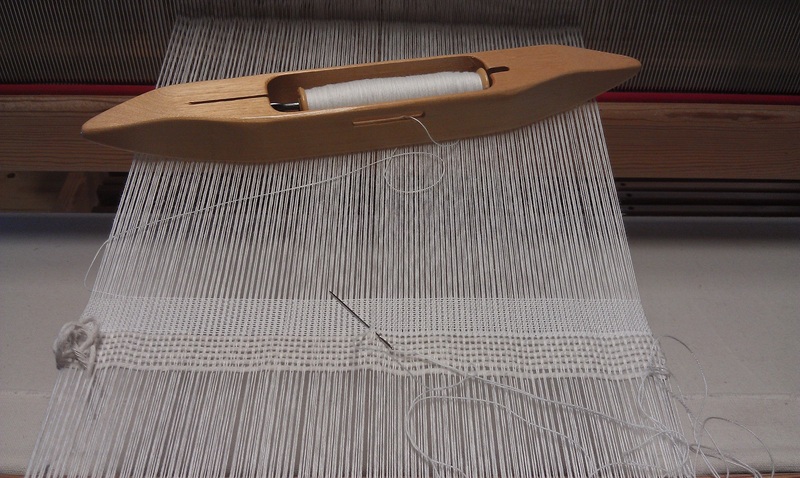 I enjoy trying and learning about new areas of weaving, while continuing to explore current interests. Tapestry is something I’ve wanted to learn the basics of for the past 2-3 years. I had started a year or more ago, but the timing wasn’t working out with commitments I had made, so a new attempt is underway. I’m hoping with a few months of winter ahead, I’ll have more time to give to it daily. 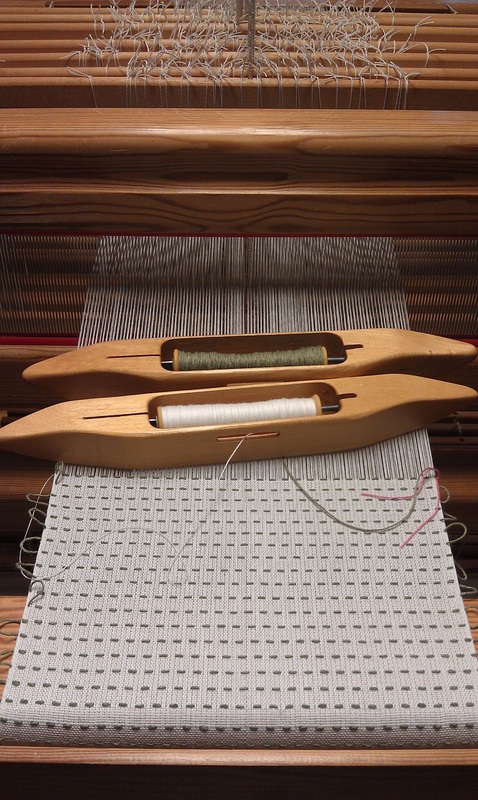 To that end, I signed up for Rebecca Mezoff’s “Warp and Weft: Learning the Structure of Tapestry: (all-three-at-once! ), almost two weeks ago, and since then have been working through the reading and videos, and ordering warp and weft which just arrived two days ago. Now, it’s time to make a warp and learn how to beam a warp on the Glimakra Regina,… very exciting! Harrisville Highland in autumn colors. 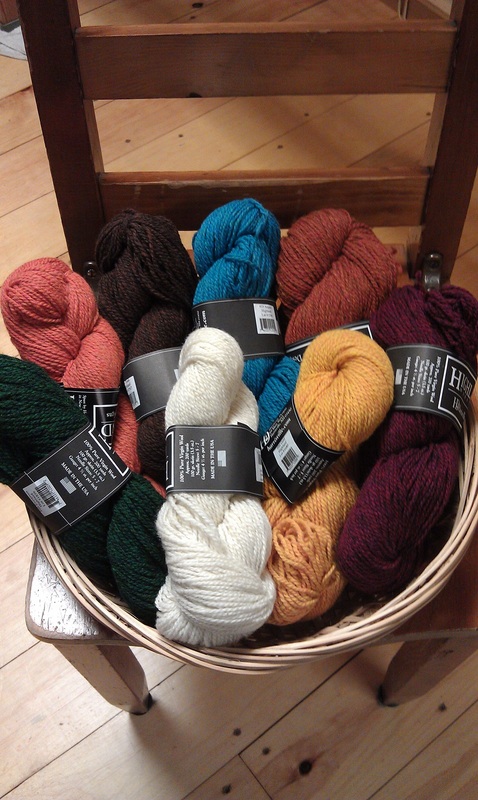 At the time the yarn was ordered, we were at peak autumn color, and those are the colors I ordered. Autumn went by so quickly I decided capturing it in a tapestry sample would extend the season. Just over a week ago I had a phone call from an area TV news program reporter, asking if she could come visit and interview me. I was a bit hesitant, but agreed, and the day and time were set. She didn’t know until later, but the interview was the morning of my 65th birthday! The video can be found here. A couple days after it aired, I received a phone call from a gentleman whose (late) wife was a weaver,… would I be interested in purchasing some yarn. 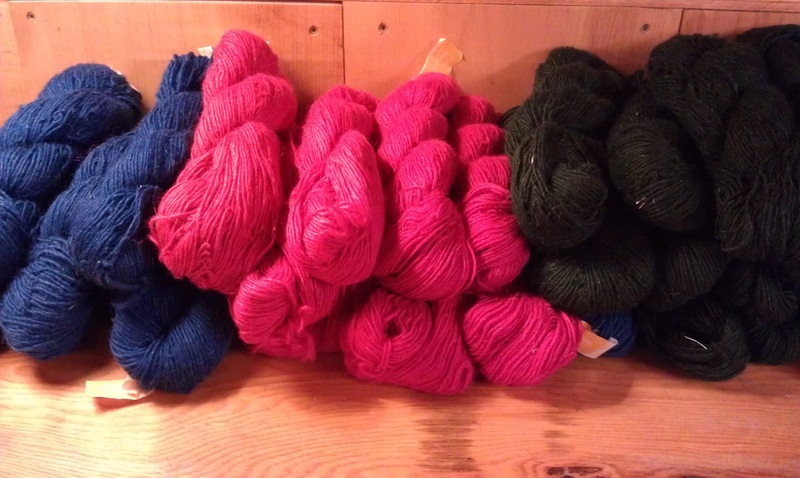 He arrived a couple days later, and I added 33 skeins of royal blue, red, and evergreen Marks Mattgarn to my weaving yarn stash. I’ll think of you, Alice, when it is woven up. 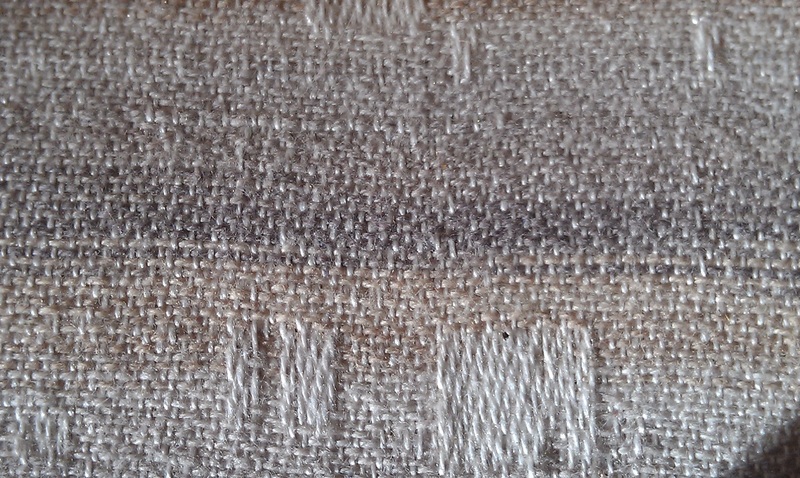 Woven shibori continues on my countermarche loom, currently 10 shaft/12 treadle, straight draw twill, 100% Bockens cotton. This particular scarf is planned to be an infinity scarf. After that, I believe I’ll change the tie-up for longer floats. First scarf off this twill warp. This scarf still needs to be washed, pressed, and have fringe twisted. I like the slightly meandering lines. This warp needs to be woven off, or re-threaded and new tie-up as I have a custom order to do and I want a different look for the borders. After several more scarves for Artistree Gallery, and after I have my online shop finally up and running, the next warps will be for my first attempts at woven shibori garments. I’m looking forward to this and expect a lot of trial and error, and learning. 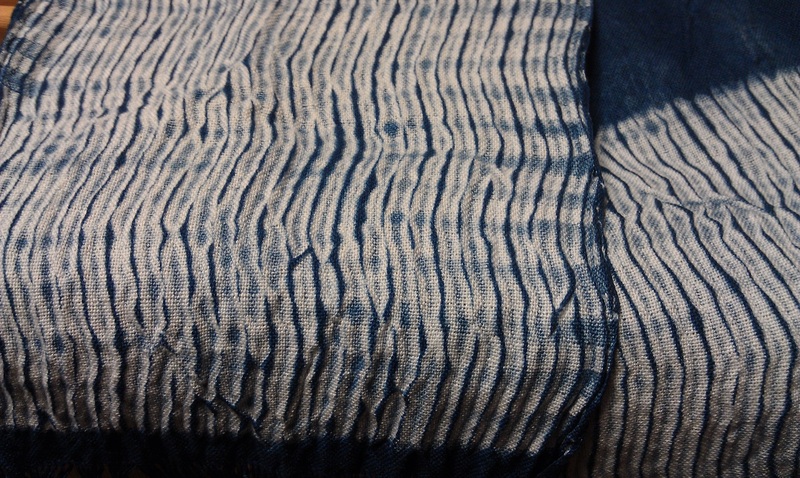 This woven shibori was meant to be a scarf with hand-twisted fringe. Unfortunately, I ran out of warp just before the end, no fringe for the end, so it will be used in sachets, part of a cushion, or other work. Single-unit drawloom, waiting for this weaver. 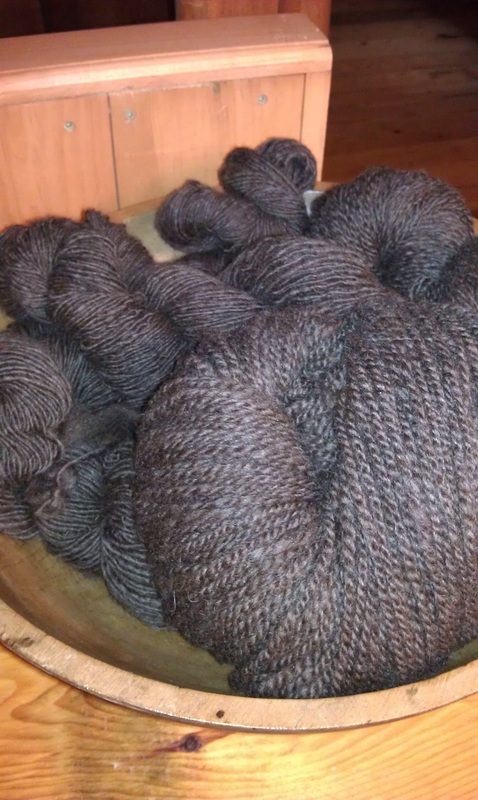 I wrote about Spinzilla 2015 in the previous post. When I went to ply the yarn on four bobbins (into two skeins of 2 ply), the plying head driveband was nowhere to be found (and is still missing). However, I wasn’t going to wait to find it, and a new one is on the shelf. I need to place each skein on the yarn swift and re-fill the bobbins, then do the plying. Then back to occasional spinning (there is quite a bit more roving left). I’m hoping the yarn won’t be too bulky for a sweater; if it is, then a knit or woven shawl. Someday this project will be done. Homemade valances for the kitchen. One last small home project the past three evenings has been picking the hems out of seven valances and the linings, so 14 panels in all. I had these in the kitchen a few years back and want them up again this winter, but shortened by a couple inches. Two left to do, then I can rotary cut the couple inches off each, re-pin, and machine sew. They should be up in a few days! Living in a log home in the woods, curtains have never been needed, especially in summer with windows open. But in winter, that added color makes the kitchen feel even more cozy. Being thankful for the blessings in my life, I like to contribute to programs that speak to me. KIVA microloans is one, Adopt-A-Native-Elder is another. 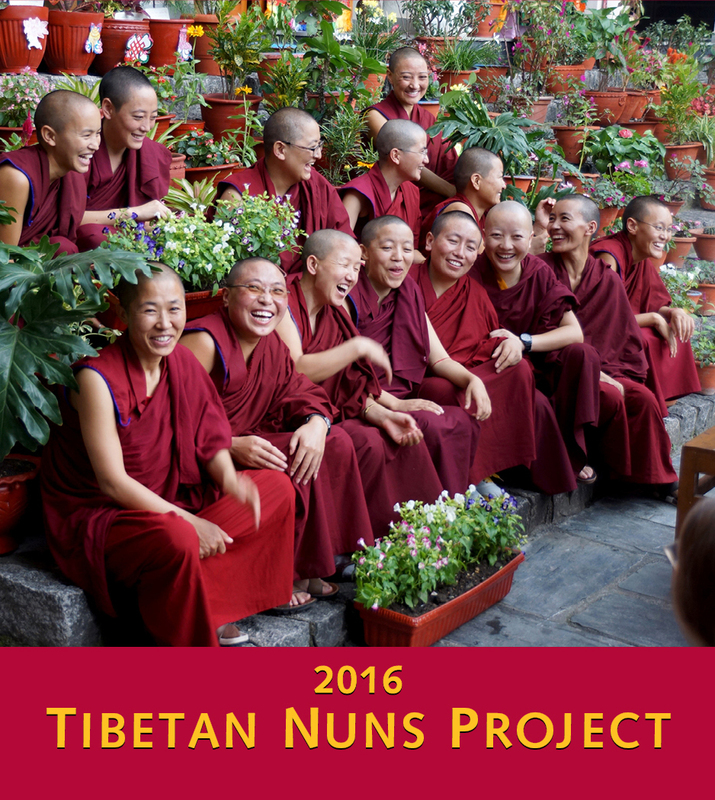 A month or so ago, another program crossed my path, The Tibetan Nuns Project (website), and TNP Facebook page, and I have made the commitment to sponsor a Tibetan nun for a year (it will be more! ), and have been learning about their lives, struggles, and goals. We can add happiness to our lives in many ways. I had thought previously about giving a percentage of what I earn to a cause or program, and a few days ago decided The Tibetan Nuns Project would be the one. In addition to my sponsoring the young woman, 10%+ of what I earn will go to either sponsoring another nun, and/or towards the needs of the nunneries that TNP are working with. The Tibetan Nun Project in Shuttle Works Studio. 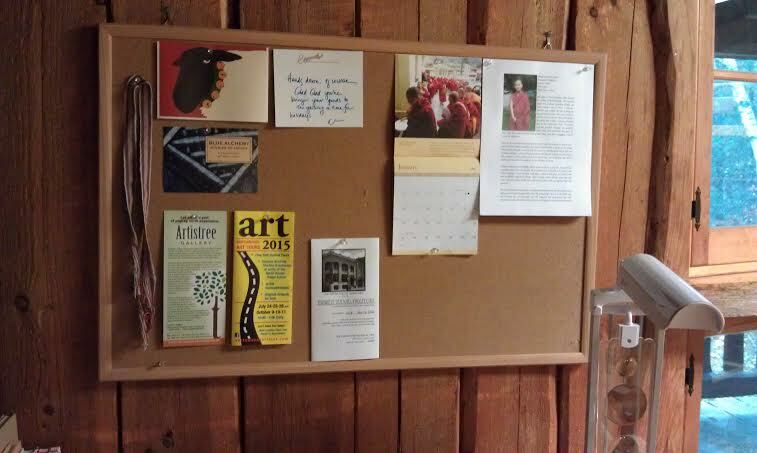 So, as a positive reminder, a photo of the nun I sponsor along with her information, and a 2016 TNP Calendar are posted on the bulletin board over a work table, near the loom I spend the most time at. 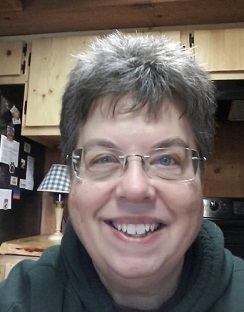 I’m looking forward to an occasional letter exchange with her, reading newsletters and updates about the nunneries and program, making TNP another reason to keep on weaving! Oh yes, all that isn’t enough, I have a few sock orders to do, Artistree Gallery wants socks, and Louise (friend) and I are planning a first attempt at warp painting in November, before it gets too cold. It’s good to keep busy with things we enjoy doing! I had emailed The Tibetan Nuns Project to see if there was a photo I could use, without breaking copyright. Later in the day I did this blog post and had not yet heard back from them. Well, I have heard back, and a photo was sent, and here it is! Tibetan Nuns Project photo, provided by and used here with their permission. 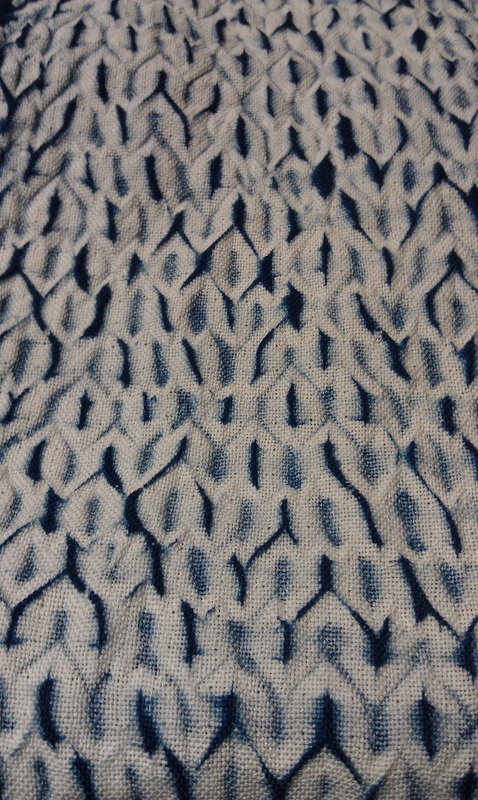 Hemstitching a new woven shibori scarf. 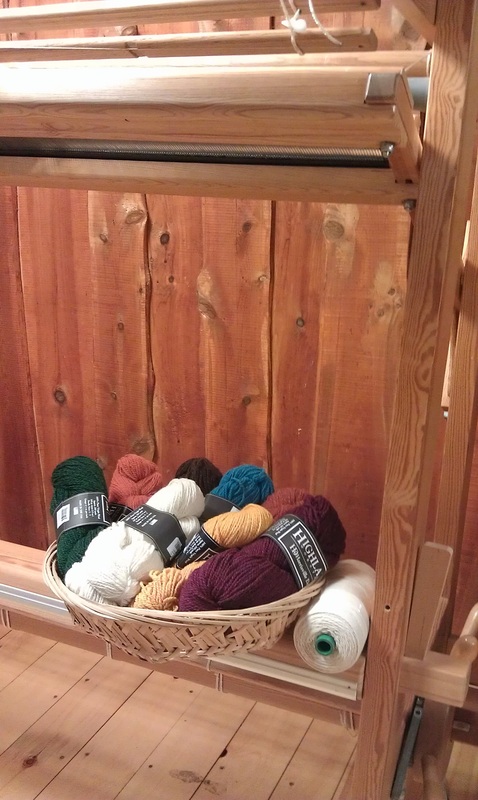 It feels good to be back in my weaving studio again, surrounded by looms, threads, and books. I’m a bit late getting started on plans for the new year. A tooth infection, the flu (both in January), followed by a more severe tooth infection (same tooth), so in mid-February, I took time off to heal and take better care of myself. 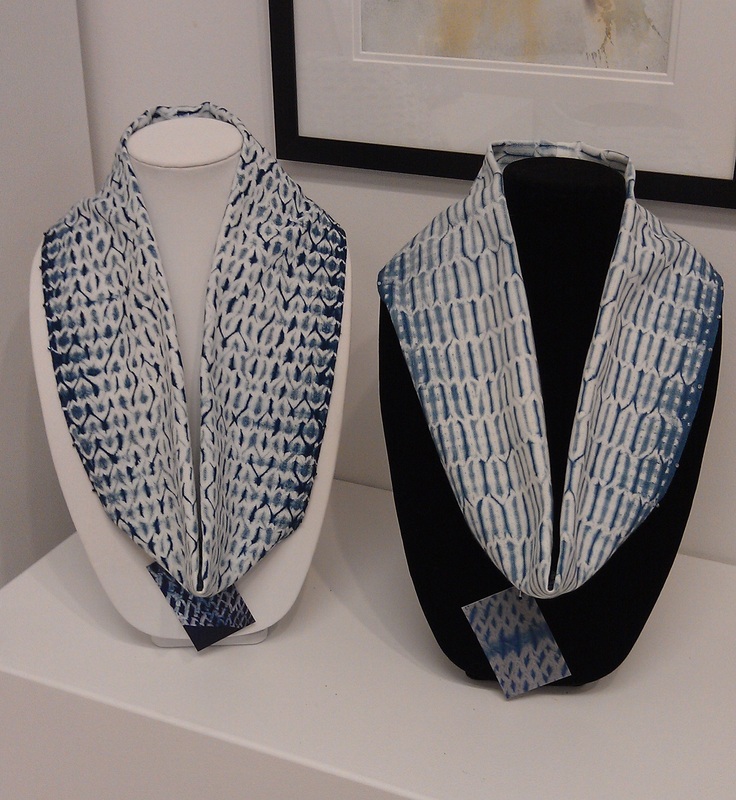 I did meet the deadline of completing the woven shibori screen and three scarves for the Art Gypsy Trunk Show/Exhibit, now at Nicolet College Art Gallery,… the show ends Saturday, March 7, 2015. Woven shibori scarves will remain the focus this year, Yes, I have noticed a lot of “blah” photos here, it’s not easy to make them interesting or exciting, until you reach the indigo dyeing stage. I am hungry for COLOR in weaving so I expect to slip a different warp/project in on occasion. 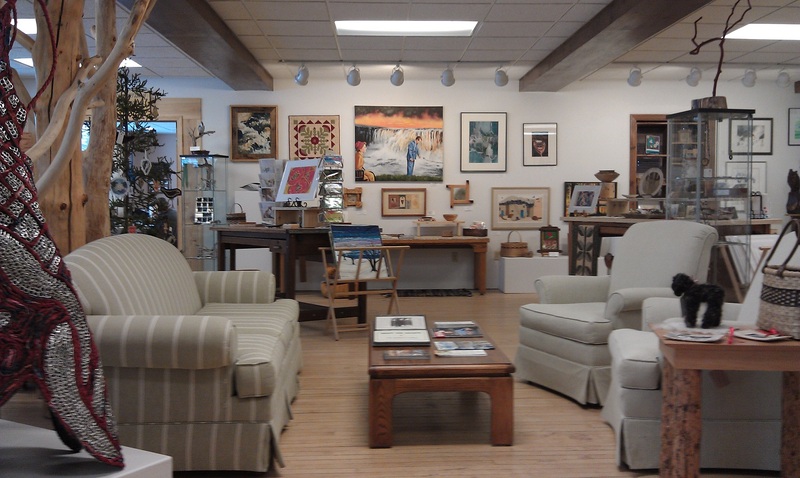 Artistree Gallery, Land O’ Lakes, WI. 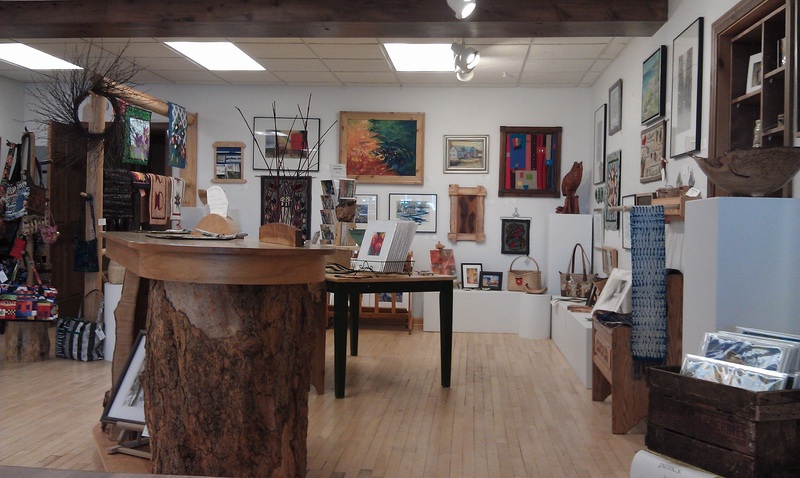 Artistree Gallery, a cooperative gallery in Land O’ Lakes, WI with work of about 30 area artists, is waiting for more new work. I’m told they will take anything I weave that is woven shibori technique. Open now four days a week, they are closed the month of April for cleaning and rearranging, then re-open May 1st. You can find more info at https://www.facebook.com/ArtistreeGallery. Also coming up fast is the Art Gypsies June 13th show/sale in Minocqua, WI, as well as the Northwoods Art Tour (summer and fall). A lot of weaving to do and socks to be made. Drawloom warp is not clear, threads sticking. I’m having issues with the warp on the drawloom. I really like weaving with the Bockens 16/2 cotton, but the threads stick together and it takes treadling a couple times at this sett to maybe have a clear shed, or clear each shed with a weaving sword. Tiny spots of white where they should not be. Random single threads showing (white) should not be there. It was suggested to me to re-sley to a bit wider sett, so I need to do a bit of research for sett for 16/2 cotton in satin weave. With more sunny days (I hope!) it would be a good time to do this, then enjoy weaving in the sunshine. IWarp ends from previous owner need to be cleared from the Regiina. The Glimakra Regina rug/tapestry loom has been sitting here now for a year. It was a busy year, and sometimes I need time to ponder what I want to weave while busy with another loom. I’ve decided I want to begin with a Rana, weft face weaving traditional in Norway and Sweden. There are nice examples in a number of books, and I need to order warp and weft so I can finally begin weaving on this loom. And yes, there will be COLOR with this weaving! The two harnesses with heddles are on, I just need to remove remaining warp ends from the previous owner, and add treadles. So, a lot more woven shibori coming up for Artistree, the Art Gypsies show, and the art tours. 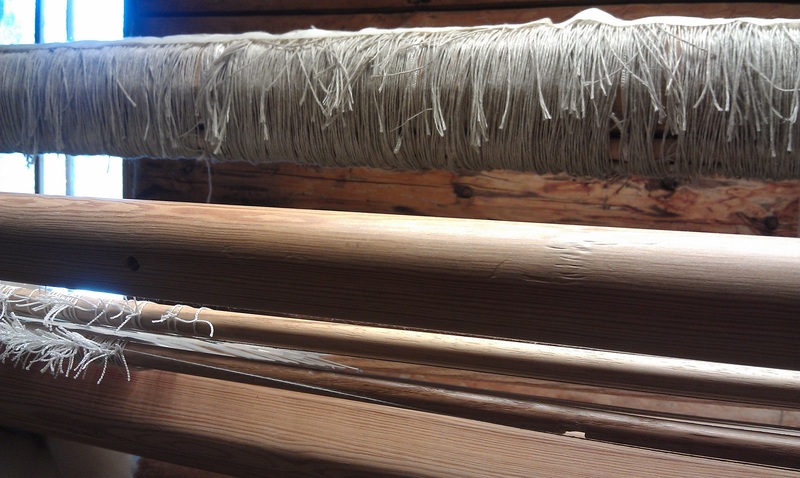 Also, some Norwegian weaving, also for the art tours as well as for my home. 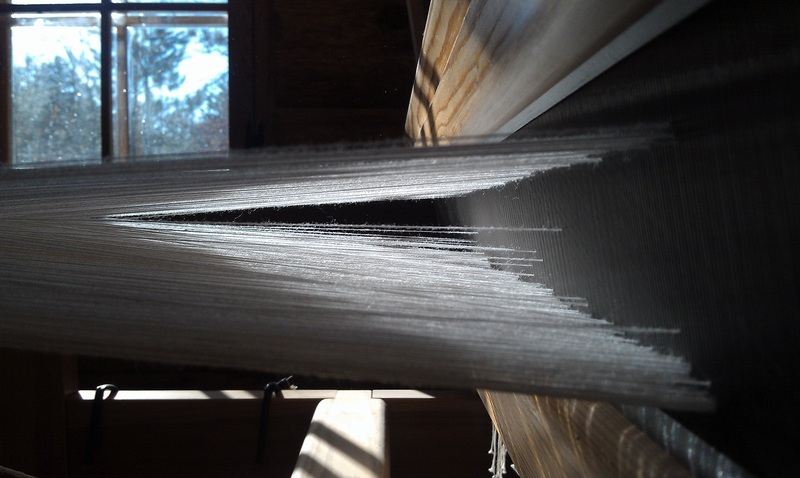 And I now would like some handwoven valances on windows, so there is plenty to weave over the coming months. All this along with occasional visits to my 87 year old father, as well as my grandson & family. I’m looking forward to continuing my weaving interests, exploring, learning, successes as well as challenges. Now, back to my loom! I am very happy with the progress made this afternoon on the drawloom. I looked closely again at photos of a drawloom, identical to my loom, taken about 29 years ago. The counterweights looked to now be at the proper height, but the beater seemed low so that was raised, then came more adjusting of shafts, lamms, and treadles. At long last we seemed to have quite good sheds, with just a few threads out of place, but I believe they are being caused by two broken warp ends tangling with neighboring threads, and they will be fixed Thursday. You couldn’t really see them in the photo yesterday, but there were some loose, “baggy” heddles on the first four shafts and I was wishing I’d replaced them while threading. Then I decided three shafts not being used would be removed right then, so that was taken care of. I bought this drawloom used, about 29 years ago, and it came with “string heddles,” made from what feels like seine twine, but slightly finer than the 12/6 sold today. Four years ago, after calculating the heddles I would need, I found there were nowhere near enough, so I went on a two or three evening binge of making the needed long-eye heddles. It turns out I had left some of the old ones on the loom in case they were needed. 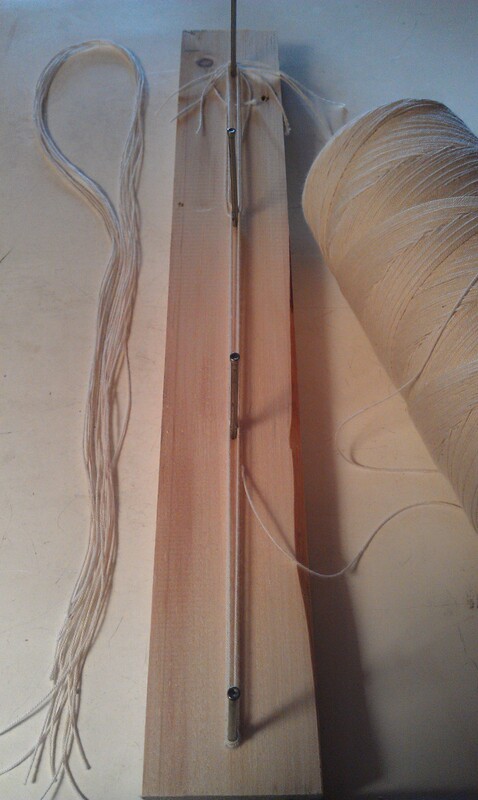 Homemade long-eye heddle jig (made on short notice, by Char). 150 made this evening. 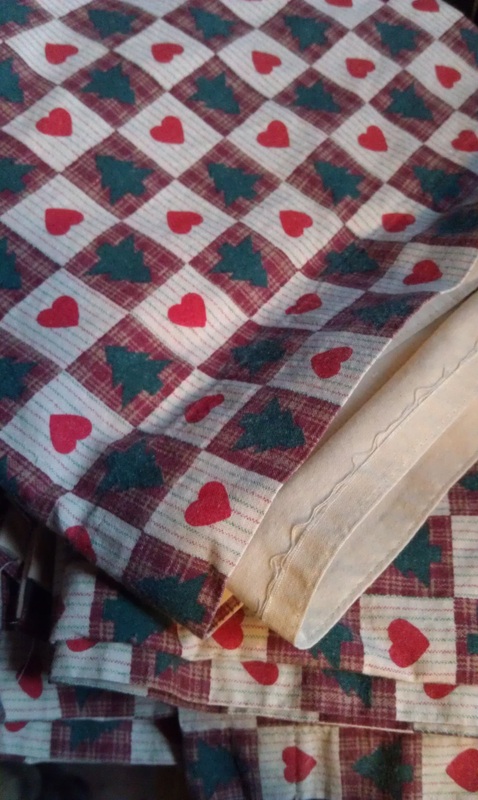 They were needed, but after threading, sleying, and lashing the warp on, I did not like the baggy heddles constantly moving outward, so the warp was un-lashed, and the threads in the baggy heddles were un-sleyed and un-heddled. Then I asked Char, on rather short notice, if she could quickly make a heddle jig using one of my long-eye heddles for a pattern. She did, and another 150 long-eye heddles (always keep a tube of 12/6 seine twine in your stash!) were made. Late this evening, the tremaining original heddles were removed from shafts 1-4 and the new ones placed on the shafts. In the morning, I’ll re-thread the 150 or so threads, re-sley, lash the warp back on, check the sheds again, and hopefully, at long last, finally be able to start weaving! I think I’m fine, but a couple members of my family said they can see the excitement! Perseverance is a very good thing! And having Char to help puzzle all this out and help make adjustments has been a blessing! Thank you, Char! After we were done this evening, I was showing Char examples of double-harness weaving including an example of weaving I’d done on this drawloom 29 years ago, a piece woven on a loom with an opphamta attachment 30 years ago, as well as my samples from the Basic Drawloom class at VavStuga (from Nov. 2012). She was surprised and a bit impressed with what can be done on these looms. And now I’m looking forward to years of double harness weaving! There will be a break while I weave and Char continues with her woodworking projects, and then we’ll see about getting the opphamta attachment added to the standard loom. I can hardly wait!